Hello! Even though it says in my 'About Me' paragraph that this blog will contain some interior design posts, I so rarely write interior designs posts because I finished remodeling my house years ago and have no desire to remodel anymore. However, due to wear and tear because of time, I still have to replace and redo on occasion, and this old glider was in need of a redo! Now, I'm sure if I hired an interior decorator, the first thing they would want to get rid of in my sitting room would be my old Amish glider rocker which I've had for over fifteen years. However, I wouldn't let them because this rocker is a MUST; for practicality outweighs visual and artistic beauty! 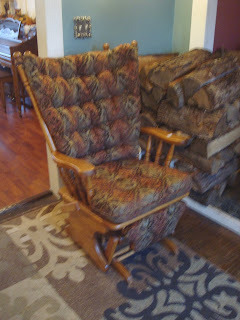 Every room in my opinion needs to have a chair that is comfortable for an aging friend or relative to sit in, and this is that chair. Anytime a grandparent comes to visit my home, without question this is the chair they gravitate towards. Most modern furniture today has that cozy, comfy, sink in feel---which I love, but elderly people need a firmer chair that's easy for them to sit down, and get out of, which this chair does. So I keep it, regardless of what it may look like, for my elderly guests to comfortably sit in. Because this chair was made by the Amish, it is very well made and has lasted over fifteen years, and will probably last till the day I die. However, the cushion desperately needed to be replaced. It was dirty beyond being able to clean, and it started to develop several holes and tears. The chair sits right next to our wood stove, so it is very comfy and warm. Here is a picture of what the previous cushion looked like. It was just a solid red color which matched both the red background of the fireplace alcove and the adjoining dining room. And here is my NEW Cushion. I love how it still has shades of red in it to match the fireplace alcove and adjoining dining room, yet it also has the browns, blues, and gold colors that are in both rooms. I feel that this cushion blends with the colors of the rooms so much better than the solid red cushion did. I can't tell you what I had to go through to find this cushion. 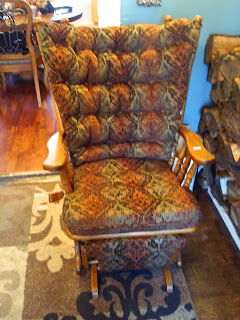 Because the chair is so old, there aren't any pre-made cushions available anymore; and although I can sew, I just didn't want to tackle a job this huge. So on my day off, I drove about a half hour into Amish Country to find an Amish store. Then I had to look through hundreds of fabric samples to find one that would work in my room. Then I had to pay $200.00 to have the cushion custom made for the chair, when the original price of the chair was only $500.00. My husband thought that was ridiculous, and that I should just buy a whole new chair. I felt that would be wasting $300.00, so I opted out of that idea of his. Finally, I had a THREE MONTH WAIT before the cushion was complete, in the mean time the chair was unusable because I had to give up the old cushion so they could use it as an example. So the whole experience was quite the ordeal, BUT, in the end, I ended up with a beautiful, custom made cushion, so all is well with the world. LOL! And yes, that's my firewood. We heat our house with wood, and my husband only likes to bring in wood once a week rather than everyday, so I have to look at all that wood all the time. Oh well, such is life! I agree, I love those style chairs!! They are so comfy!! Love the new upholstery!! It was worth the effort the chair is beautiful!